I love pickled peppers on submarine sandwiches. They add just a little pop of zing which really perks up even the plainest meal. It never occurred to me to put peppers on a pizza, however. I can credit that to Jodi at the thrift shop where I spend money volunteer. I really don't know if the banana peppers on the pizza we ordered were pickled or not. I just knew after having a single bite that I had to try my pickled peppers on a pepperoni pizza. The members of my family are not huge hot pepper eaters, and when a hot pepper plant is producing, it's going crazy. In most of the farm shares I've joined, we either got no hot peppers or a pint a week. I used to use a few fresh farm share hot peppers in salsa and donate the rest of the week's haul to the food bank. Then I tried pickling my own hot peppers. My spouse took a jar in to work, and I was rewarded with even more hot peppers to pickle! This summer, when your garden, your CSA farm share, or your spouse's coworker give you even a quart of hot peppers, I recommend checking out Food in Jars. Marisa's blog really de-mystified small batch canning and encouraged me to try just a give it a try and see how it went. I used to check the Ball Blue Book Guide to Preserving out of my local library until I found it red-stickered at a Target clearance end cap. Score! Back to the pickled peppers for tonight's pizza. If you haven't put up pickled peppers, pick up a jar at the store--or maybe there's one on the door of your fridge? Go see! Because I loved that pepperoni and pepper pizza, I figured I'd try and make it at home. I kept it simple with respect to the dough, sauce, and cheese. This time, at least. I just let the pickled peppers give that little pop of zing which did really perk up the slice. 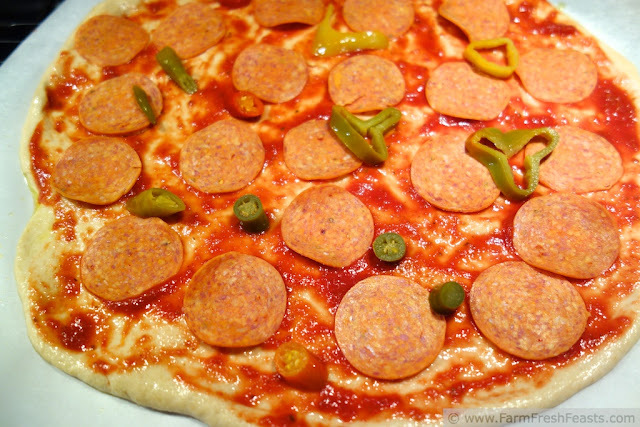 A perky poppy pickled pepper and pepperoni pizza. Preheat oven to 450 degrees Fahrenheit. Baking stone in the oven? Check. Use a cookie sheet if you don't have a baking stone. On an oiled sheet of parchment paper, stretch out dough into the shape that floats your boat today. 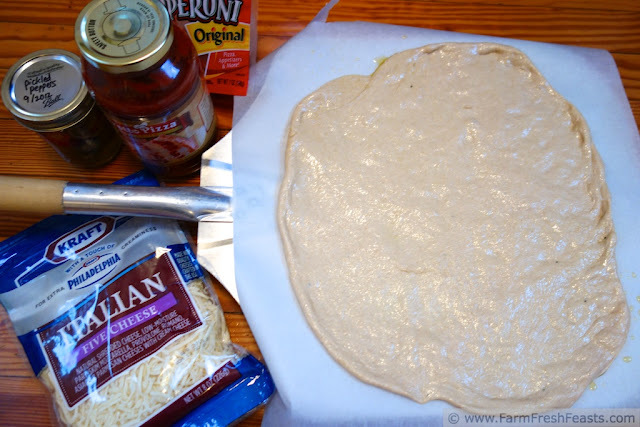 Spread sauce across the dough to the edges. Top with portly pepperoni and pretty pickled peppers properly placed in a pleasing pattern (that's why I'm the mom, honeybun). Scatter cheese across the top. Transfer the whole thing, parchment and all, onto your baking stone (or slide the parchment onto your cookie sheet and stick it in the hot oven). Bake for 5-8 minutes, then shake the parchment out from underneath the dough and continue to bake another 3-5 minutes until the cheese is browned and bubbly. Cool on a rack a few minutes. Slice and serve. Enjoy! And stay tuned, because my friend Heather and I collaborated (meaning, she gave me all the ideas and I wrote them down and made the pizza) on a vegetarian pizza featuring pickled peppers. Coming to a Farm Fresh Feasts blog near you in July! Why July? You'll have seasonal peppers then, I hope. This post is shared with the Farm Girl Blog Fest, with the Clever Chicks Blog Hop, What's Cookin' Wednesday, the Wednesday Fresh Foods Link Up at Gastronomical Sovereignty, What's In The Box at In Her Chucks, and Foodie Friends Friday. Well, would you look at that--I made an edge with the crust. Sort of. This is, hands-down, one of my favorite pizza combinations! I'm the only one in my house who likes it though, so I only make it when we're having mini pizzas so I don't have to share. I can't wait for more peppers this summer to make another jar! I wish I lived close, I'd share one of my jars with you! I'm going to be investigating the mini pizza action this summer, since I will be making many pizza combinations that the kids won't be interested in eating. Either that, or maybe I could set up a pizza stand next to the lemonade stands in our neighborhood . . . I'm more of a mild pepper fan, so I'll be growing banana peppers this year for pickling. This entire post is a tongue-twister -- love it! Sometimes I have a bit too much fun writing. I just wish I could figure out a way to get the words in my head onto the screen while I am walking the dog. I dream up the best things, but by the time I get home the brilliance has vanished. Umm.... yes please!!! 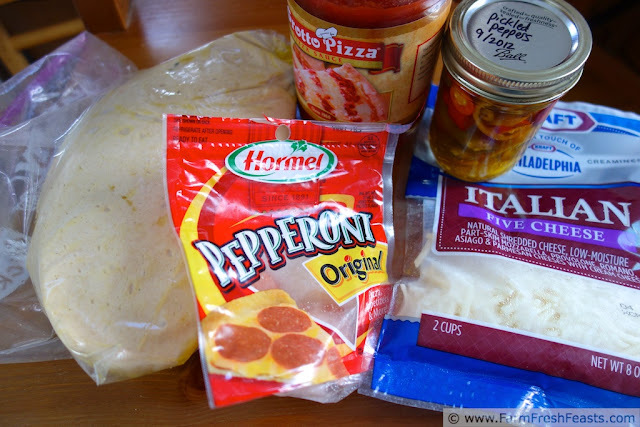 I love pickled peppers too, and I have always had a weakness for pepperoni pizza, so I love the idea of putting them together. Will have to try this one! Pepperoni is definitely a weakness on pizza. Sometimes I just crave a good pepperoni pizza, you know? Anchovies will always be my first love on a pizza, but everything in moderation . . .
What a great idea! Sounds like a perfect idea for a range of ages. I hope you blog about it! It was fun. And I have notes for next time – more dough, more cheese and coordinate the toppings better. And there will be a next time, since there were several families who were disappointed they couldn't make it. I'll have to blog on the next one. Nary a picture made it onto the camera – too much flour flying. Next time, definitely! I'm here for my pizza fix! Feed me, please!! :-D Looks soooo freakin' good! I'm happy to give you your pizza fix! Now, if only I could give you leftovers, too! Such a whimsical way with words you (and your daughter have), not to mention pickling peppers. I do declare, this is something I'd like to try this summer. The pickling peppers that is...and the pizza, minus the pepperoni, although I bet they are perfectly pleasing. Nicely done! Wait to you see the veggie pickled pepper pizzas I've done (yes, plural). 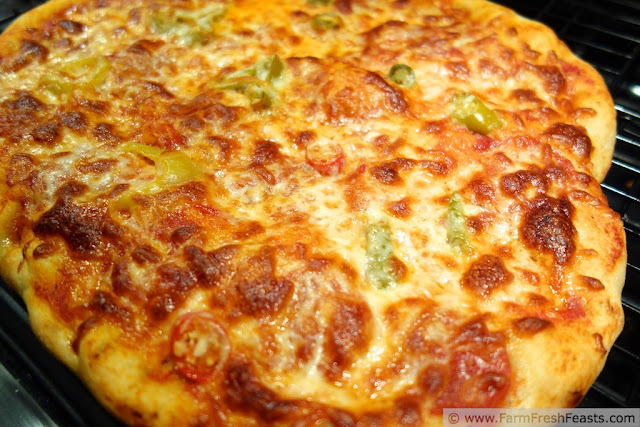 Pickled peppers are a great addition to a veggie pizza. They are also simple to do. I've been increasing my canning jar collection at work--Spring is not a bad time to check thrift stores for old jars. This sounds really good. I've never attempted a homemade pizza but I think it's time I do. Go for it! I dumped a decade's worth of homemade pizza knowledge all over my Pizza Primer post, but really the best thing to do is just go for it. And let me know how it turns out! This sounds awesome. I am going to have to make it soon. Thanks for sharing on Foodie Friends Friday. It really was tasty--and inspired me to play around with more vegetarian options with pickled peppers too. Stay tuned for a few of those later. Thank you so much for hosting! I realized that getting pizza delivery during our last move, while waiting for the gas line to be installed to our new stove, gave me a ton more ideas for pizza toppings. Amazing how a new environment can spark your creativity. I'm sure your new home will do the same.